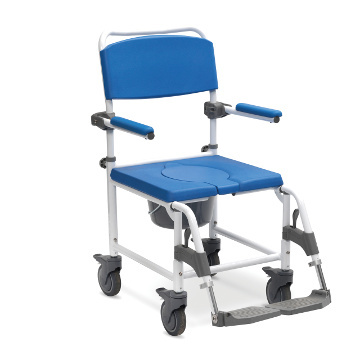 The Aluminium Shower Commode Chair with wheels is perfect for people who need a commode but also want the convenience of a wheelchair for easy transportation and mobility. The seat cut-out provides comfort and allows the chair to be positioned over a standard toilet for use, but also comes with a bucket to be used anywhere it is required. The aluminium frame of the Shower Commode Chair is an attractive white colour and is also resistant to rust which makes it ideal for the shower. Footrests come standard and include adjustable height and angle footplates. The Aluminium Shower Commode Chair is ideal for anyone who is looking for a shower chair and commode for their home. The Commode is produced by Drive Medical a well respected international supplier of medical products. Suitable where access to the toilet is difficult or restricted. Transports users between the toilet to the shower. Easy to clean, comfortable with Polyurethane seat. Rustproof aluminium frame which is lightweight and easy to manoeuvre. Can be height adjusted and can be used over all standard toilets. Footplates can be adjusted without the need of any tools for different user requirements. Footplates move in and out for easy transfers and storage. Armrests can be flipped up for side transfers. Adjustable backrest suits all users and can be detached easily for transportation and storage. This commode has a removable 5 litre bucket with a lid. 4 Braked castors offer extra security and easy manoeuvrability. Clears standard and disabled toilets for optimum versatility.